Add custom laser etching to your razor! Add a classic, personal, or custom touch to your razor! Just select the text, etch location and font type, and we'll laser-etch it into your razor. You can choose to have your etching centered on the blade face or towards the toe of the razor. Etching by default is done near the toe as seen on the pictures of Ryan's Razor. 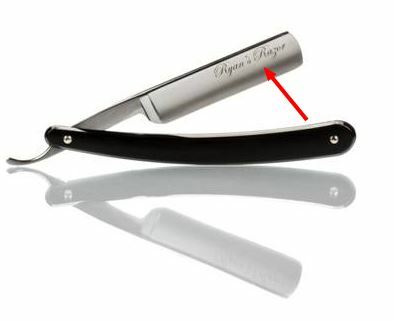 Etching will on the left face of the razor unless the razor has factory art/etching then it will be on the opposite side. Please refer to picture below. Your razor will be in the shop for 1-4 business days. After the service is complete we will return your razor directly to you via the mail service you have chosen at checkout. As noted, by default, the etch will be on the front side of the blade, towards the toe, on the top side of the blade, near the spine. In the case that there is a logo on that side of the blade, then the etching will be on the same location, on the other side of the razor.